Finding the best selling items on eBay is vital for people who want to make a good profit. If you know what to sell on eBay, this will actually lead to more sales and more profits. In fact, if you ask an eBay power seller for advice on how to sell on eBay, they will advise you to first look for the best-selling items. In this post, I will reveal five smart techniques to help you find the best selling items on eBay. Brainstorming is a very good solution to create ideas for what to sell on eBay. 1-Look around your house, car, street, restaurants, local malls, and other places around you. You will actually find many ideas for best selling items on eBay. 2- Buy any lifestyle, tech, shopping, business, or any other magazine from the bookstore. Try to buy a traditional magazine and not an online magazine. The reason simply is that when you read electronic magazine they are many distractions like Facebook, Twitter, and others. With traditional magazine you will focus more on reading. Make a cup of tea or coffee and read the magazine slowly; you will get many ideas from magazine ads and pages. 3-Amazon, eBay, and Walmart best-seller items. 4-eBay Trending Collections: You can visit eBay and navigate to a section called “Trending Collections”. There you will find lots of ideas on best-selling items on ebay. 5-Alibaba product categories and best-seller lists from Ali Express. Here, you will find lots of potential product ideas to sell online. 6-Look for shopping forums and see what people are looking for and what are they talking about. 7-Visit social media websites like Tumblr and Pinterest. Search for an item name and see how popular an item is. You will get many ideas from these social media sites. 8-Search Google for websites that sell the coolest items and look at what are trending at these sites. 9-You can watch TV programs about shopping, tech or related programs to come up with new ideas. To find out suitable TV programs just go to the TV’s website and see its list of programs; you’re sure to find some related programs you can follow. 10-Use Google Trends to tap into Google’s hot searches, and to determine which keywords are the most popular. Once you are on the home page use the navigation menu to the left and explore. There you can look for keywords by country, date, categories, and type. These tips can help speed up your brainstorming. Try to utilize them to find your best selling items on eBay. Terapeak is one of the best eBay market research tools that evaluates the sales of completed listings on eBay, continuously. 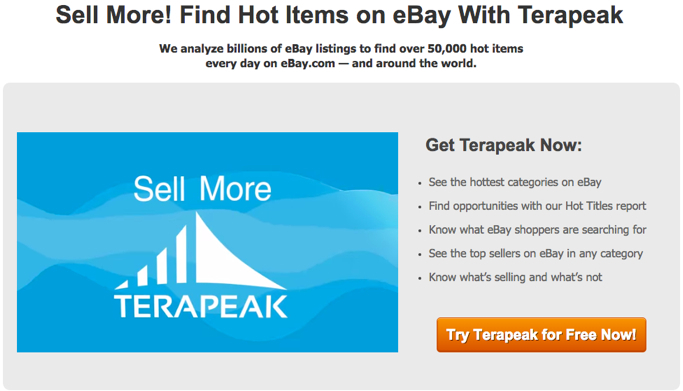 By using Terapeak, you can have access to 365 days of eBay data on completed listings. This data gives you a clear understanding on the demand for an item you want to sell. You will have access to trending items, average bids per item, competitor searches, number of completed items, and even sourcing from Alibaba.com. Since eBay has partnered with Terapeak, it offers accurate data. Terapeak has also developed other eBay tools that can actually dig deeper and perform more detailed research for you, like Listing Analytics. It is amazing how the data can be helpful. >> Here my complete Terapeak review. Try Terapeak Now for Free! Digging into auction sites is one of the most important methods to discover best-selling items on eBay. However, be very cautious not to overpay for those items or you may end up losing money. Auctionbiz shows listings for auctioneers from all over the US, and it offers a variety of auctions from small to big auctioneers. Auctionguide covers auctioneers from all over the world and they have comprehensive listings. It is best to start working with cheaper “country” auctions and then move to a more expensive city auction as you earn and learn more on how to find the best selling items on eBay using Auctionguide. ShopGoodwill – The popular “used goods” store is an excellent eBay seller source. PropertyRoom – Police Auctions, and very good, active website mainly for items confiscated by authorities. Although competition is high on this site you can still find good items to sell on eBay. The site offers quality items like computers, car, jewellery and more. 4-Local Yard Sales and Electronic Bulletin Boards. 1-Craigslist is one of the best places for eBay Power Sellers. Here is an example of a search for “digital camera” which shows a long list of great deals. If the item on Craigslist has a lower price than what it sells for on eBay, contact the seller quickly to buy the item. To save on shipping costs, you can also go to the buyer yourself to collect the item. 2-Yard Sale Treasure Map: One important site that offers yard sales – it is a great site that has lots of yard sales in your local area. If you have enough money you can invest in an inventory. Many online sellers do this where you will have to pay upfront, but always be careful and watch out for scams. Most items normally arrive from closing stores or overstock inventory. To look for inventories just google the word “wholesale pallets” and you find many useful results. One excellent example is RhinoMart wholesale distribution. Always look for sites that show clear photos of the pallets and have good listings contents. By doing this, you will pay reduced prices of what the items are actually worth. That means you can make a significant eBay profit easily. Finally, there are many possible ways to find the best selling items on eBay. If you have other ideas and tips please comment below and don’t forget to share the post with your friends on social media. SaleHoo is one of the best suppliers directories that helps you source items with drop shipping and wholesale capability. Read more about the company here!